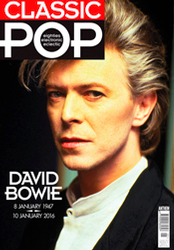 Ian Peel was frustrated that pop's greatest decade wasn't getting the recognition it deserved, so he founded Classic Pop magazine. Three years later the bi-monthly glossy has a readership of over 25,000 and whether it’s New Wave, synth-pop, indie, ska or the New Romantics, Classic Pop has it covered. What is the best part of being the Founder and Editor-at-Large of Classic Pop magazine? The best part is the feedback from our readers and the artists we feature, and their feedback is always exactly the same - they love the fact that we're writing passionately and authoritatively about an artform that no one else covers. On a personal level, even though we're now three years old, I'm still blown away when I see something I dreamed up and pitched on whiteboards - which was then made real by the very talented team at Anthem Publishing - sitting on someone's lap on the train. What is your favourite year of music? It's always the same answer: this year. Coming a close second is 1984. I think we once wrote it was Orwellian in its importance and the way it shaped music. What qualities do you look for in your cover stars? I think all our covers have been visually quite arresting, not only in terms of how the artists look but about what they 'say' about pop music. Every issue we work with an artist or group who visually jump off the shelves - especially compared to the other music magazines out there - but who also convey a spirit of innovation and longevity. Who is your ultimate pop icon? My ultimate pop icon would possibly be John Lennon. My ultimate pop group would be The KLF. What are the challenges of being the magazine's Editor-at-Large? My challenges are more theoretical and philosophical, compared to the logistical and practical challenges the Editor has. By that I mean thinking about the balance of content, the attitude, the tone, and the style of the magazine... I was Editor for the first 20 issues and we set out to be different from the start: not just in terms of content but in terms of how a music magazine thinks and feels. For example embracing streaming, Spotify and playlists. Or not being afraid - as magazines often are - of giving our individual writers their own voice. Being a magazine with it's own sense of wit, that's not afraid to comment on itself. What is your favourite way to relax once an issue is completed? I can't stop, actually. I always get the most done on the next issue as soon as one closes, as I'm so in the zone. Your magazine specialises in the classic decade of pop, how do you keep a bygone era interesting? The artists do it for us, in that they've never stopped creating interesting music. Our job is simple: we just take notice, and write about what they're doing now, the value of what they did then, and how they've influenced what happened since. So in the current issue Ella Eyre talks about The Buggles. Jam & Lewis talk about Taylor Swift. Gary Kemp talks about Bowie. Adamski talks about the Human League. And the Human League's Martyn Ware talks about Shingai Shinowa. We're not 80s obsessives, we're pop music obsessives with good memories, who like making these interesting connections. What can subscribers expect from future issues? Why subscribe? All of the above! I also love our 'event'-based features. They're great fun to put together and we're always working on new ones. I did one a while ago called the Synthpop Summit in which we reunited Howard Jones, Blancmange, Heaven 17 and Thomas Dolby for a think-tank. I'm working on another right now which will hopefully be driven by a live, audience-based Q&A. Our 'Top 100 Albums of the Eighties' edition caused a storm on Twitter. And our current issue has our second annual Classic Pop Awards, which saw the involvement of some seriously A-list talent, from New Order to Naughty Boy.